Your spouse opens the refrigerator and removes a carton of milk. He asks, “How long has this been in here?” and you shrug your shoulders. He opens the carton, takes a big whiff, and recoils in disgust. You think he might actually start crying. Are you kidding me? You have very clearly shown that what awaits me is horrific. With that ringing endorsement, no thank you. I’ll pass. You’re in a restaurant with your bestie and, upon tucking into her gorgeous pasta dish, she rolls her eyes in ecstasy and moans in a very inappropriate way. With that kind of enthusiasm, hell yes. Of course, you take a bite. And enter into blissful euphoria yourself. Whether people are trying to persuade you to take a whiff, try a bite, or buy that must-have new product, their excitement or disgust is what will–or won’t–sell you. If makers and sellers don’t talk about their own work with passion…or worse, talk about it with disinterest or disgust…are you going to be convinced to buy from them? If you hate marketing your “thing” and don’t promote it with passion…or worse, talk about it with disinterest, that’s exactly what you’re doing to your prospective clients, fans or customers. It’s the overwhelm that’s killing you. You’re trying to do everything and doing it all…badly. And you think they can fool people by plastering on a sweet smile and phoning it in. Not only can people tell your heart’s not in it, but you probably aren’t consistent and effective with your marketing efforts. If you hate blogging, will you really commit to doing it on a regular basis? Heck no. What do I enjoy doing? My joy. Where is my target audience? My tribe. Seriously. That’s it. 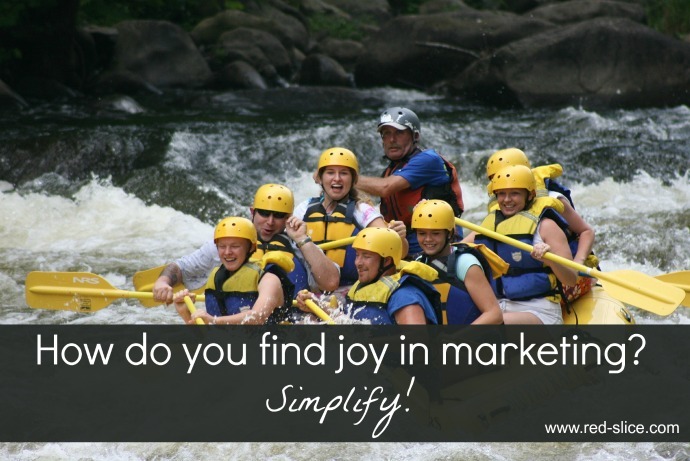 This intersection of your joy and your tribe will give you your marketing plan. And the great news is that if your target audience plays in several places, you have a choice. You may be crystal clear about #1 but if you’re clueless about #2? Ask them where they like to hang out and how they like to get new information about work like yours! It’s yours for free. My gift. Because this issue is killing you and I want you to love marketing your work, not detest it.